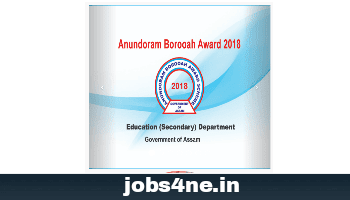 Anundoram Borooah Award Scheme 2018: Online Registration Open From 18th September 2018. - Jobs4NE : Jobs in Assam and North East India. The Government of Assam has been confering the prestigious Anundoram Borooah Award with citation in the form of a Certificate alongwith a personal computer (PC) to honour the meritorious students securing First Division in the HSLC, High Madrassa and FM Examinations conducted by SEBA and State Madrassa Education Board, Assam. The Anundoram Borooah Award Scheme was announced by Govt. of Assam on the floor of the Assembly in the Budget Session during March, 2005 as a unique award scheme to encourage competitive spirit among the students in the State. The education landscape has quite changed after this announcement by the Hon'ble Chief Minister. First there was disbelief which soon changed into awe and then into a unique emotional bonding of the parents, students, awardees and teachers for this scheme. Online Registration of Student's Data Sheet for Anundoram Borooah Award Scheme 2018. All the students entitled to receive Anundoram Borooah Award 2018 shall have to register online and fill up the data sheet. During on-line registration students need to submit their primary information like name, mobile number, father/guardian's name etc. On successful completion of the above steps, the applicant will get an acknowledgment against his/ her registration.